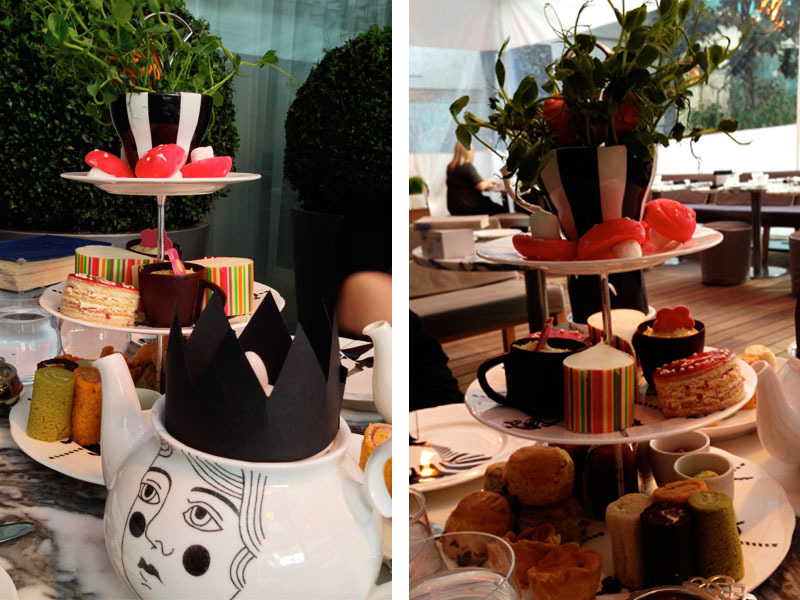 March took us down the rabbit hole, and straight into the courtyard garden of The Sanderson Hotel to indulge in their lush signature Mad Hatter's Afternoon Tea. I'm not really sure where to begin on quite how wonderful this tea was, as a whole experience. I'm sure you can tell from the pictures that no detail was too small; and it really made all the difference. From the menus printed in vintage books, to the hand written 'drink me' potion labels, to the sugar cubes hidden in musical boxes with a dancing ballerinas, everything had been thought about to encompass the theme, and executed to such a high standard, it was simply impossible not to be awed. To start, we selected some classic combinations to sample in the less classic form of tea. Rhubarb and custard and strawberry and cream were the teas we chose, displayed on the table in gorgeous glass bottles. I have to say they were unusual to taste but fun to sample all the same. Once we settled down with a more familiar cup of earl grey, we moved on to sandwiches. Previously I had assumed that really there's only so much you can do with a sandwich. At The Sanderson, however, they did so much more. Spirals of different coloured and flavoured breads, wrapped around scrumptious fillings of smoked salmon, ham or cucumber and cream cheese. There was a small tart which was divine, and even a savory scone which I surprisingly enjoyed, alongside the sweet scones. You've probably guessed by now that I do have a pretty epic sweet tooth, and oh my... those cakes did everything to satisfy it. Every dessert held a surprise to discover, which made each bite an adventure to enjoy. A dark chocolate cup holding green tea mouse, layered strawberry cake and white chocolate mousse with a ball of mango puree hidden inside, all designed to perfection and tasting of nothing less. The sweet treats didn't just take the form of more classic desserts, the very top of our tea tower was decorated in sprouting carrot meringues and pea shoots and adorable marshmallow toadstools to send us blissfully into sugar highs. Not forgetting, of course, the 'drink me' mousse, a foamy passion fruit potion which was surprisingly refreshing. 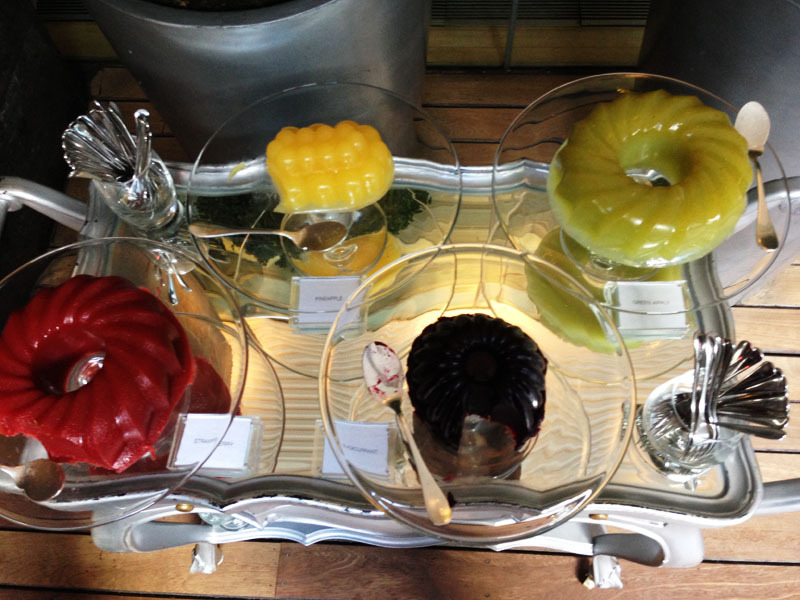 There was even a 'jelly wonderland' of which you could delve into as you liked. Taking a look now, the menu has changed since I've been, and I'm so tempted to go back and do it all again! Although on the pricier of the afternoon teas I've experienced, there is currently an offer on and I do really feel you get your moneys worth, and more, at The Sanderson. The display is exquisite, the food delicious and the staff could not have done more to help, to the point where when I was alone at the table for a few moments the maitre d' came over just so I wasn't sitting by myself, an act which speaks volumes of their view on service. 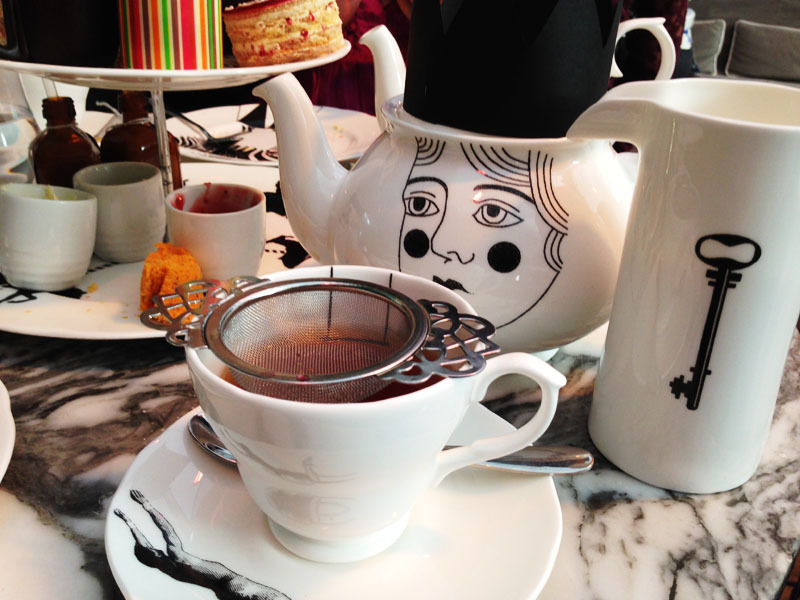 If you're a literature fan, a fun loving foodie, or just would love an afternoon in blissfully sweet wonderland, I would definitely definitely recommend the Mad Hatter's Afternoon Tea at The Sanderson. I love your photos dear! Thanks for sharing. Wow! The place is so cool, its unique and very stylish cafe! Thank for your comment on Qing's Style. Please always keep in touch! 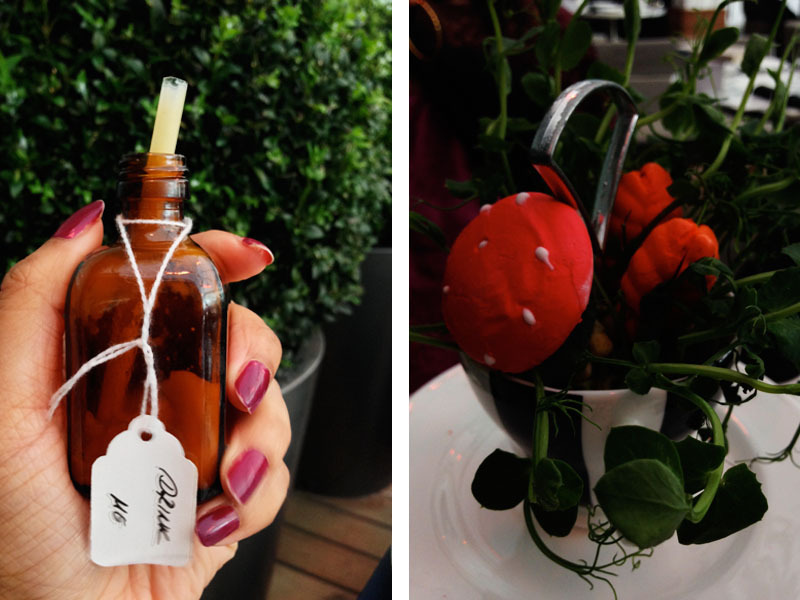 Having tea at the Sanderson is a lovely experience! It's so cosy and chic :) Love your photos! 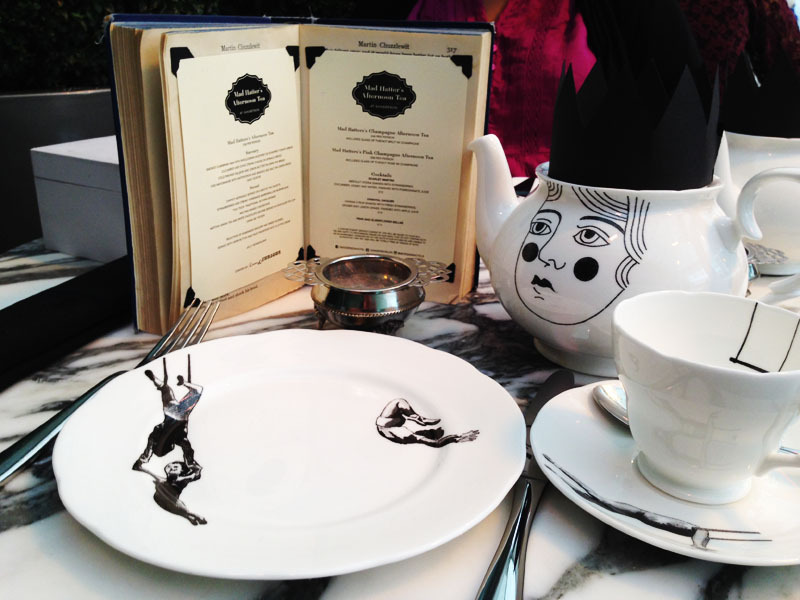 I love how quirky this afternoon tea is, it looks so atmospheric. this looks amazing! Love those plates, they're so cool! What a lovely arrangement. I love tea so much! It sounds like a stunning experience! Thanks for sharing Miss! Rhubarb tea sounds like it would be amazing! Looks like you had a great time, I love doing things like this! Anything involving tea or food and I'm in. Yummy! So cute, I love tea! Being a huge fan of Carroll's Wonderland masterpiece, I'm experiencing a slight awe and envy looking at these photos through pixels and a screen. The details are wonderful, and oh, how riveting the sandwich must've been; it sounds amazing! 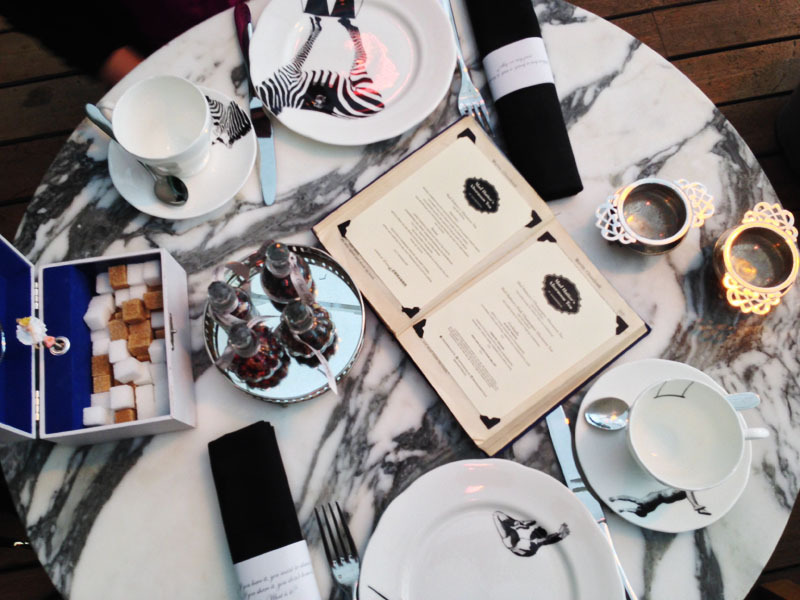 I'd pay any price to go to a Mad Hatter tea party any day. I really have to go out and get afternoon tea soon. The only question is: Should I go with the husband or treat my mother? 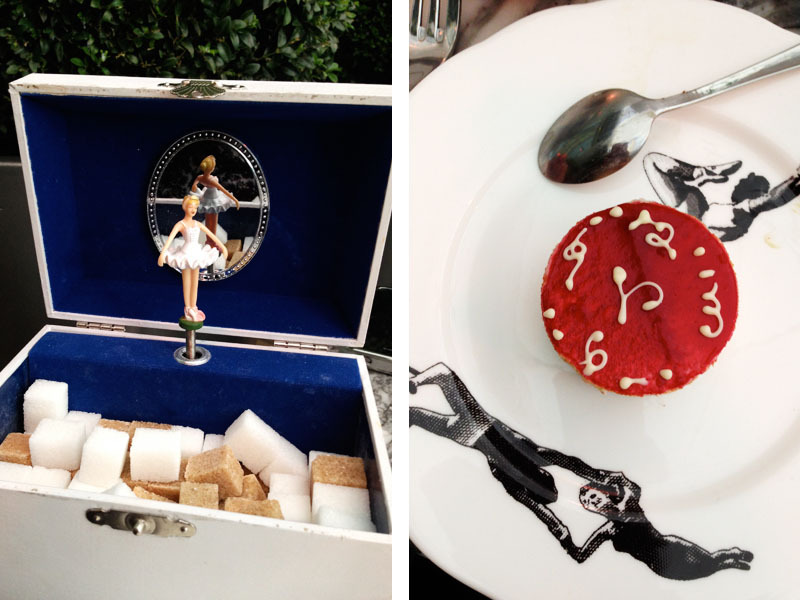 This looks like such a beautiful place to have tea <3 I love the sugar in a music box! 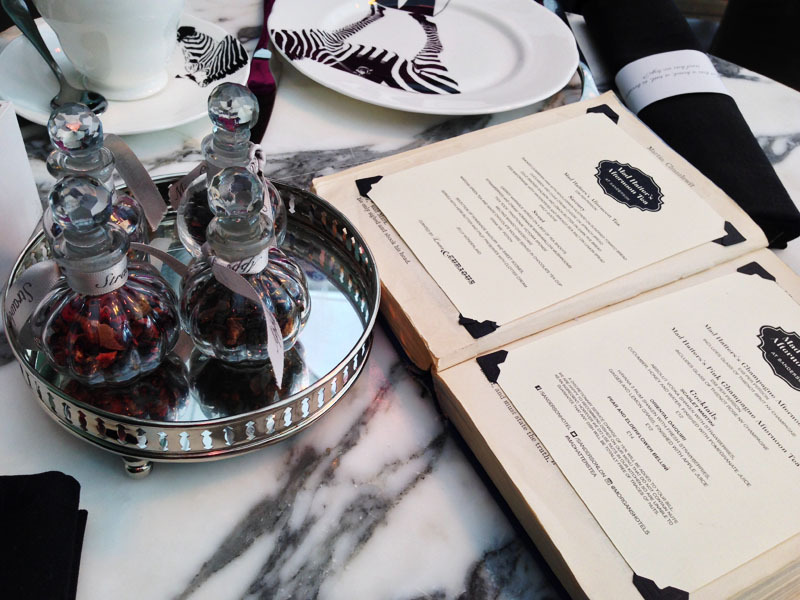 This place looks too good to be true, I love Alice in Wonderland! Lovely photos and the place looks really great! This place looks awesome! You visit some really neat restaurants! And your pictures are fabulous. beautiful photos. i am in love with cups and plates. Oh my goodness, I totally adore this service and the whole decoration! Plus the food sounds really yummy, too! My, my! This is certainly some afternoon tea! I adore the whole alice in wonderland theme but this is on another level isn't it? Everything is so detailed and beautiful, I'm seriously jealous! Gorgeous! I absolutely love the Alice In Wonderland inspiration, one of my favorite books ever. Lovely post! Love your Afternoon Tea posts! Great fresh updated take on a classic activity. Love that zebra print! What a gorgeous spread and tea set! I've always wanted to go here for tea! I've been to sketch for tea in london, and that's about it! So happy I found your blog! Would love it if you could check my blog out too! Such a pretty setting! Love the tea set! And how delish does everything sound! Wow! This tea looks fabulous. I love going to tea but I've never seen one like this. It sounds like it was a fantastic experience. Your photos are amazing! Thanks for sharing them with us. Ah! This is all so cute, everything looks so adorable! I just love the ambiance of this entire place. I love the tea cups and everything else that's on that table. I so wish I could be there enjoying everything this place has to offer. Thanks for sharing this with us. Wow so nice, it looks truly amazing! It sounds like such an awesome idea!! AHHH! I wanna go there so bad. Such a great place for afternoon tea! AMAZING! Their plates, and cakes, and all these small details, everything! Wow such amazing clicks, Raj!! Loving the place.